Utilize Siri-like features on your Mac. Is there a better alternative to Quiri? Is Quiri really the best app in Productivity category? Will Quiri work good on macOS 10.13.4? Quiri = Siri + query, and it lets you play a song, look up contact information, check the score in the ball game, and more - all with your voice. On your iPhone, Apple's Siri allows you to access a wide variety of information and perform different tasks. Now you can do most of the same on your Mac. Quiri no longer needs to be restarted when changing preferences. Dark mode now uses the system dark mode. Quiri needs a review. Be the first to review this app and get the discussion started! Quiri needs a rating. Be the first to rate this app and get the discussion started! 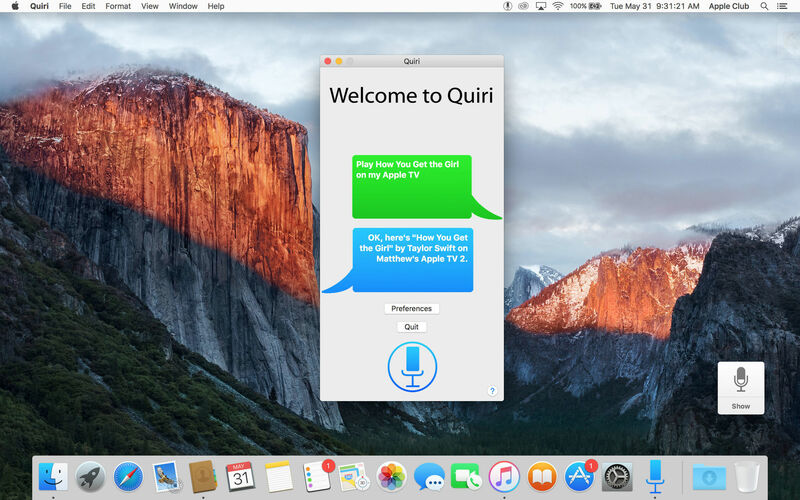 Quiri lets you use your voice to enter a command. It can tell you information about someone in your contacts list, schedule appointments, or display weather, sports scores and more from Spotlight. Anyone can just call up a Spotlight window and use Dictation, of course. But with Quiri, that process is automated, and there is another major advantage: Quiri will provide voice feedback to tell you about the results it came up with. It can also do more than just access Spotlight - ask "What is [name]'s birthday?" and Quiri will read it aloud and call up the relevant contact card. Tell Quiri to "Play [song name]" and iTunes will play the requested song. Say "Play [media name] on my Apple TV," and Quiri can even have iTunes stream the content to your Apple TV. You can say a command by clicking a button in the app, clicking the menu bar icon, or even just by saying "Hey Quiri." Even Siri on the Mac cannot do some of this! Quiri is also very customizable, allowing you to change the colors of some interface elements, or enable Dark Mode. "Enhanced Dictation" must be enabled for Quiri to understand your speech. If it is not already enabled, you will be prompted to enable it when you click the Quiri button in the app, or you can open System Preferences on your Mac and go to Dictation & Speech > Dictation > Use Enhanced Dictation. It is a separate 1.2GB download. Quiri works best if you have installed the additional voice "Samantha," but this is not required. In the Dictation & Speech pane of System Preferences, select the "Text to Speech" tab, then under the "System Voice" drop-down menu, click on "Customize." Enable the voice from there.